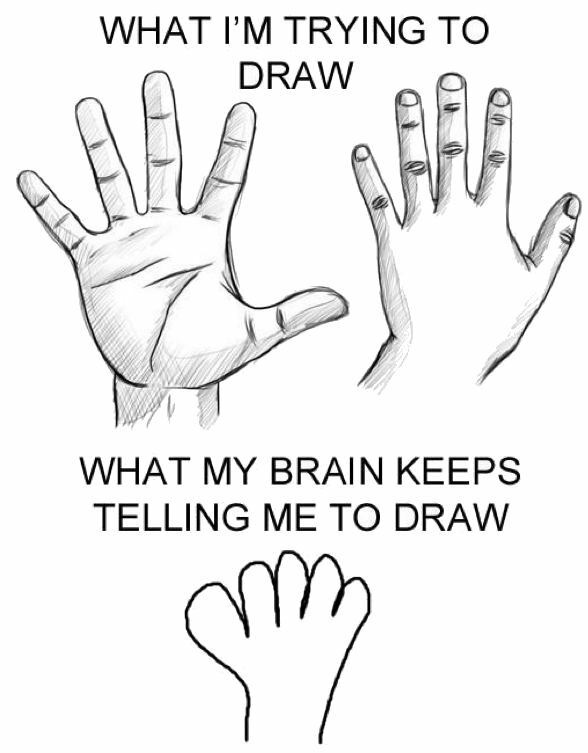 You've probably heard it from students many times... "I can't draw!" It's my biggest pet peeve. It's a self-defeating attitude that prevents the student from experimenting and improving with practice. If the drawing isn't perfect, a student will give up in disgust. When asked why they aren't finishing their picture, they say "I can't draw!" "I had an "I Can't Funeral." I had [the students] all write what they couldn't do from art to every other topic and then they folded their lists and we stuck them in a coffin... they didn't know what we were doing at this point. Then I gathered them all and said that we were all gathered for the funeral of our dear friend, " I Can't." He had been a good partner and has given us many years of security. He had many aliases: 'It's too hard,' 'I don't know how,' etc. (make it up as you go)... He is survived by his brothers and sister "I can", "I will", and "I am going to try my best." In the future when we feel like we need "I can't" we will turn to his brothers and sisters for strength and we will make it through our tough times..... Then we had a moment of silence and put the top on the box. I think that the teacher I borrowed from even buried the box outside.. I just put a tombstone on the wall and wrote R.I.P "I Can't" and the date. It was cool because even though it was corny every time someone said I can't someone said "I can't is dead" and pointed to the wall." So what do you tell them? By sharing with them some of the people featured on this page, you should get through to them. These people had every excuse in the world for not drawing. These people never said those nasty words, "I can't draw." The first person I would like to introduce you to is Brett Eastburn, alias "The Stub." Brett was a fourth grader where I taught him art at North Liberty School in North Liberty, Indiana awhile back. He used either a wheel chair or a skateboard to get around. He would lay on his stomach on top of the skateboard and propel himself with the stubs of his arms. He could move much faster than his wheelchair this way. When it was time for him to draw or paint, I would sit him on top of the table and he would use his teeth, his stubs, and his shoulder to cut, glue, and draw. Nothing could stop this guy. To read more about Brett and his incredible story, visit IAD's page about him. Still not convinced that saying, "I can't draw" is foolish? Well then, let's look at another person, Joni Eareckson. "In July 1967, when she was seventeen, Joni (pronounced Johnnie) Eareckson dove into Chesapeake Bay and broke her neck; since then she has been a quadriplegic, confined to life in a wheelchair. In her first book, Joni, she told the story of her accident and her subsequent struggle to accept her handicap." Joni puts a pencil in her mouth to draw. As you can see in the picture at right, her picture of the kittens is quite good. She drew it all with her mouth! Joni doesn't believe in the "I can't draw" syndrome either. She says her faith in God has helped her to overcome her paralysis. Information about Joni's artwork is available by writing: Joni and Friends, P.O. Box 3333, Agoura Hills, CA. 91376. You can find her books and prints sold on the internet. Joni still speaks across the nation and gives inspiration to many people. Do you still say you can't draw? Boy, you're a hard case. That means I'll have to introduce to you yet another person who never said that they couldn't draw. Queenie Archer was 11 when her mother put her in a place for the mentally handicapped. She wasn't really handicapped, her arms and legs were crippled by cerebral palsy, a disease that slowly eats away your muscles. She had no visitors and wasn't even allowed to decorate her room. Instead of saying she couldn't do anything, she decided to make the best of her situation. She is now a 46-year-old woman. "Look at me," Queenie says. "I'm an artist. I'm in one of the best group homes in the area. I always got something to eat. I got my own room. I got all my earrings and my hair bows. I got my mom and my sister. Some people out there, they don't have anybody." Queenie now lives in Davie, Florida, in a cerebral palsy group home. After a lifetime of injustices, she still sees enough beauty in the world to paint pictures that sell for as much as $1,000 apiece. She paints with a brush sticking out of a contraption on her head. "I'm a survivor," she says, and grins. "A wild woman." Today she daydreamed that she would be working on her picture of cats in a field of irises. Each petal, each leaf, takes hours. A whole painting can take six or seven months. "It doesn't matter," Queenie says. "It could take me years. I never give up." You can see some art done by Queenie as well as other handicapped artists by visiting Amazing Artwork, a site by a company in Fort Lauderdale that employs handicapped artists. Are you satisfied yet? Don't tell me you're still complaining about your drawing abilities! OK. Then I have another one for you. The next person I'm going to tell you about is Henri Matisse. Henri Matisse was born on December 31, 1869 in France. He became a famous artist by the year 1900. By the age of 78, he became a cripple and had to remain in a wheel chair. He could barely move his fingers due to arthritis. That didn't stop him. 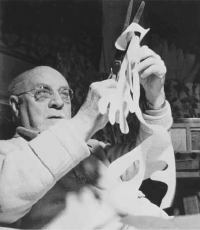 As you see in the picture, Matisse began to cut out shapes from colored construction paper and had others glue them down for him to make a collage. He did this all from his wheelchair. Soon he became so lame that he was stuck in a bed. That didn't stop him either. When he painted one of his last paintings, he was rolled on his bed in the church. "I consider it my best piece of work. I hope that the future will justify this opinion by a growing interest," Matisse said before he died in 1954 at the age of 84. Even though he was old and crippled, he decided that nothing was going to stop him. Will anything stop you? 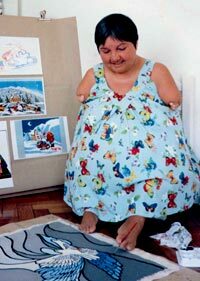 According to the Association of Mouth and Foot Painting Artists (AMFPA), Maria del Pilar Benitez Velozo (at right) was born without her lower arms. One of her legs was also irreversibly damaged. From childhood on she has learned how to use her feet to be more independent. At the age of five she learned how to sew and knit, later she also learned how to weave and make small craft objects. Her love for the arts became obvious at a very young age and she was further motivated by the lessons she received in sixth grade. After that she took up a correspondence course in drawing and oil painting. She wishes to tell people how they can develop to their full potential, and so she visits schools, talks to students and teachers and demonstrates to them how she paints or knits. She has had numerous exhibitions both in Argentina and internationally, where she received several awards and distinctions for her works. 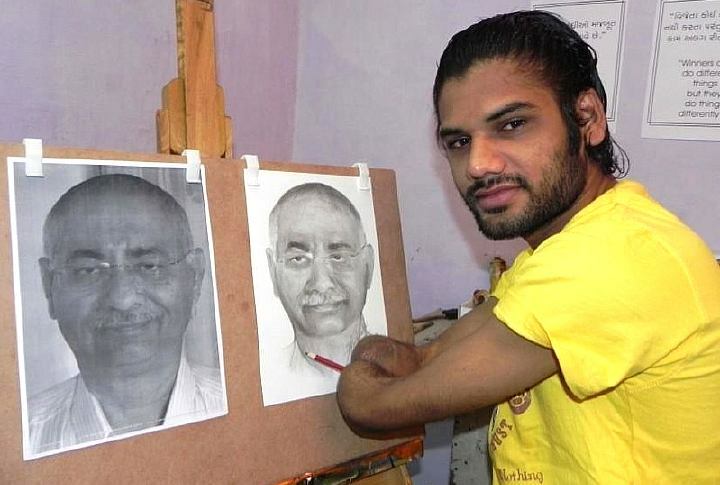 Dhaval Khatri, from Ahmedabad, India, has no hands and doesn't let that stop him from creating art. He says he became an artist "not by choice, but by chance." He lost his hands when he was accidentally electrocuted. Dhaval attributes his success to his parents who instead of feeling sorry for him or babying him, put a paintbrush between the stubs of his arms. You can see his work on his Facebook page and his TouchTalent page. His official home page is located here. Perhaps the most devastating disability for an artist is blindness. Yet, even the "I can't" syndrome doesn't work here either because we have an artist who is blind and didn't let it stop him from creating wonderful works of art. Says British artist Sargy Mann, "I had to sort of reinvent painting for myself. It seems sort of more or less impossible, but if you’re just determined to keep going… You know, you don’t need to give up. Because if your subject is your own experience then as long as you’re having an experience you got a subject. And that has turned out to be true even in total blindness." OK guys, if you still say "I can't," then you are hopeless. You are doomed to a life of boredom because you don't want to risk anything to improve yourself. We've seen several people who didn't let anything keep them from their art. There are many more like them. It's quite simple. You are able to draw and if you say, "I can't," you are too lazy or have no confidence in yourself. Here's a great video that addresses students who are discouraged with their art and think they "can't" do it. I'm sure the kids in Mrs. Fuglestad's class grow to enjoy art! Association of Mouth and Foot Painting Artists of the World, which also features many handicapped artists and their work. Ben Glenn's Living Art [Archive], which features art from someone with ADD and Dyslexia. 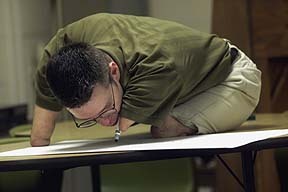 Careers in the Arts for the disabled by the National Arts and Disability Center. The Coincidence of Attention Deficit Hyperactivity Disorder and Creativity, an interesting page which addresses the connection between ADD and creativity. dizABLED Cartoons, a collection of disabled art cartoons. Center for Excellence in Disabilities - They support artists who have disabilities so they may achieve their goals for the future. National Arts and Disability Center- With articles and a gallery. Arts & Services for Disabled - They provide life-long learning, community service and career opportunities through the creative arts for people with disabilities. Arts with the Disabled Association Hong Kong - They were established in 1986 with a mission to promote the arts and artistic talent among persons with disabilities, create equal opportunities for them in the world of art, and foster social integration. Learning Disabilities and the Arts - An article on the rationale of utilizing the arts with the disabled. Mouth and Foot Painting Artists (MFPA), the USA version of the AMFPA. Special Education Art Lessons, a very good resource from Kodak for those who have students with special needs. Very Special Arts", the national organization. Also see their USA and international affiliates. See IAD's special education page! Teen painter paints with no hands. Read all the pet peeves from the menu in the left column.